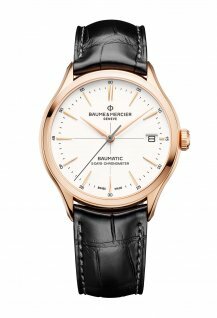 At the SIHH, Baume & Mercier unveiled two new Clifton Baumatic watches. 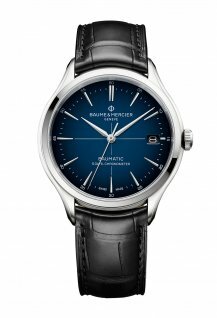 After the new Baumatic Perpetual Calendar that was unveiled at the SIHH earlier this week, WorldTempus presents the new Clifton Baumatic Gold Red and Clifton Baumatic Blue Dial. 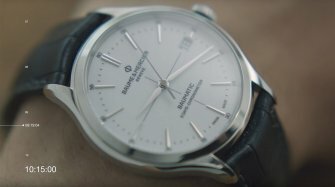 The watches use the BM13 version of the Baumatic calibre. 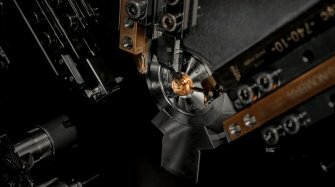 The sapphire crystal case back reveals the calibre’s refined finishes: circular-grained bridges and a sand-blasted, snailed baseplate. The openworked, steel-or gold-toned tungsten oscillating weight is adorned with a decoration combining Côtes de Genève with snailing. The watch comes in a 39 mm satin-finished red gold case. 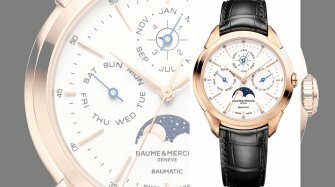 The dial, adorned with riveted gold hour markers, has a “warm white” hue with a porcelain-effect finish in perfect harmony with the 18-carat red gold case. 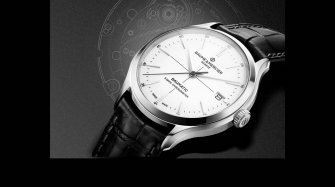 A discreet anthracite crosshair on the dial symbolises the COSC certification. 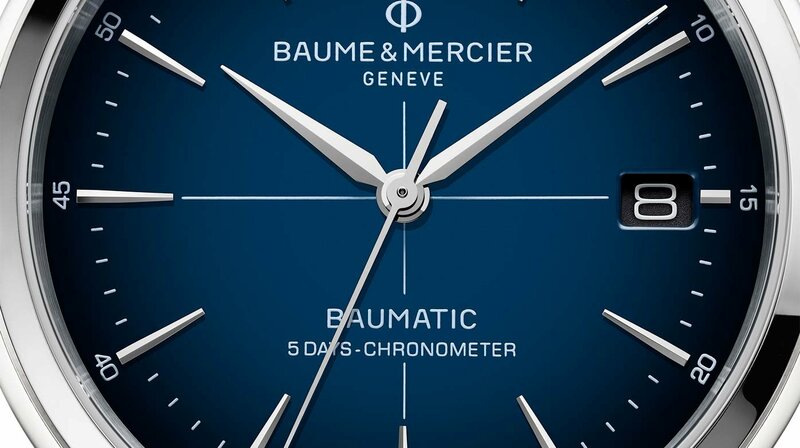 The second hand, also anthracite, contrasts with the gold hour and minute hands. 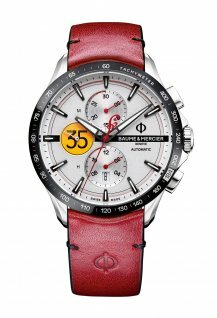 The watch is fitted with a black alligator strap with grey stitching on the top and color on the bottom, and bridle points at the buckle. The system of curved bars with very reliable lug allows to change the strap without tools. 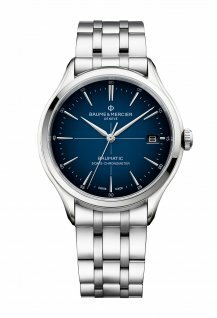 The watch has a larger 40 mm polished and satin-finished stainless steel case. 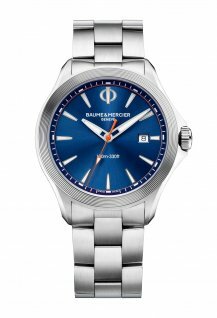 The blue-to-black gradated sunburst dial features a white minute track and rhodium-plated hands. On the COSC-certified models, a discreet white crosshair appears on the dial. The Clifton Baumatic Blue Dial is available in two versions - one is mounted on an interchangeable black alligator leather strap with a pin buckle and one features a five-row steel bracelet with a triple folding clasp and security push-pieces - and in four references: 10510 (leather) and 10511 (steel), COSC models 10467 (leather) and 10468 (steel).